The arrest takes place in the garden of Gethsemane (or “olive press”, hence its names of Garden of Olives). It is night but the scene is lit by lanterns. In the centre, two men, one of whom kisses the other; this is the kiss of Judas to Christ; a sign of recognition for the soldiers to arrest Jesus; this is what they do from behind. Jesus, recognizable with his halo, is looking at Judas. 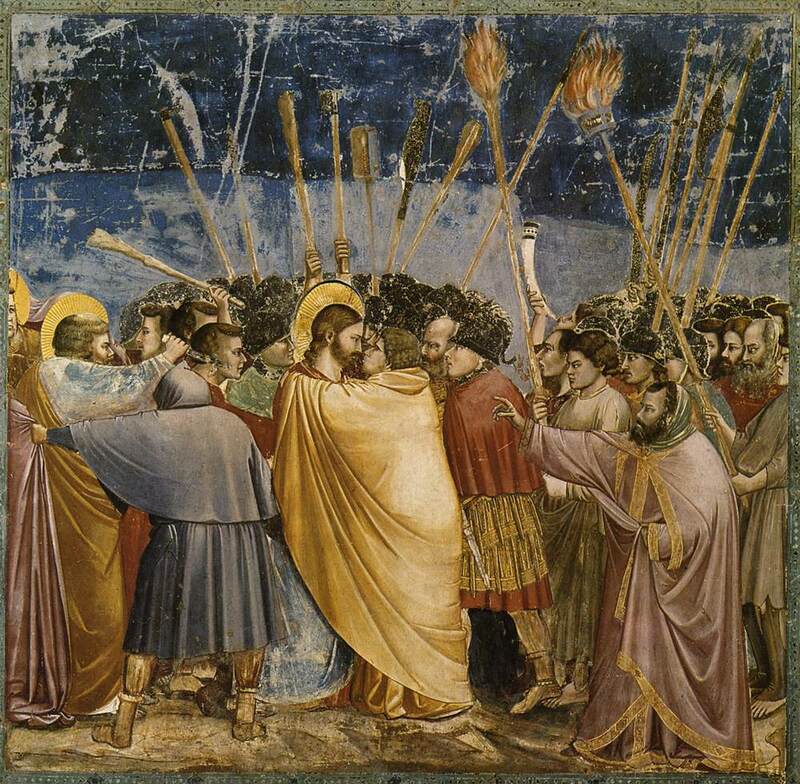 The kiss of Judas is the centre of the scene. Among Jews, one kisses the master’s hand but artists understand it as a kiss on the cheek or on the mouth. Judas is smaller than Jesus; he can wear yellow clothes, the supposed colour of Jewish garments. Wearing a beard or not, he sometimes has red hair because of a bad German joke on his name Judas Iscariot, close to the German “ist gar rot” which means “very red”. On the left, another scene: two men are fighting. One man cuts off the other’s ear with a sword. According to John (18:10), it is the Apostle Peter who cuts off the ear of Malchus, the High Priest’s servant. 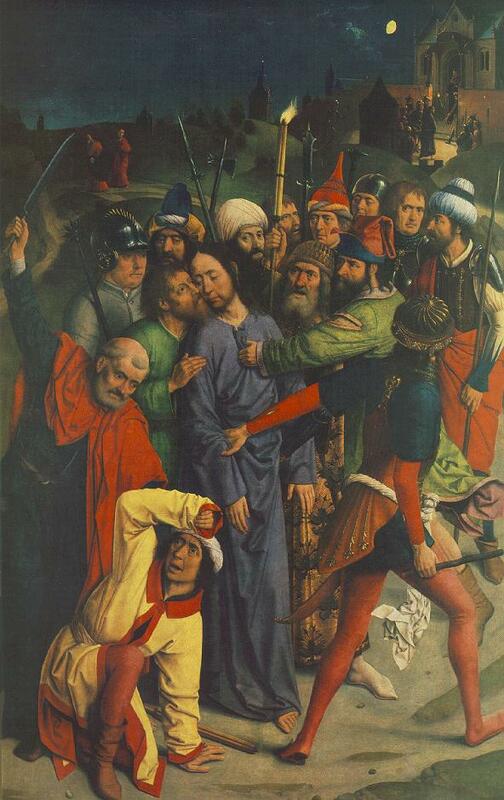 Very often, Jesus sticks it back or holds it in his hand while kissing Judas; which renders the movement totally unreal. The arrest takes place at night or at daybreak near the Mount of Olives; in the distance can be seen the city of Jerusalem. The crowd is numerous with many men armed with swords and sticks. Some of them are real soldiers who can fall to the ground since John’s gospel (18:6) reads “they went backward, and fell to the ground” when Jesus made himself recognized. The dogs that can be seen are an allusion to Psalm 22:16 “For dogs have compassed me; the assembly of the wicked have inclosed me”. Except for Peter, the disciples are passive or run away; sometimes, one of them runs naked, leaving the cloth that covered him to those who want to arrest him; this is a detail mentioned by Mark who is probably this young man (14:51). This is a dramatic moment when the kiss, a sign of friendship and love, is used as treachery and to give death. Jesus is delivered as the Lamb of sacrifice and as the suffering servant announced by the Prophets (Isaiah, chapter 53). Two complete scenes but one uses depth, the other keeps to the foreground; which gives different viewpoints on Judas’ kiss and the ear cut off by Peter. In Giotto, the latter attacks in a strange way, from behind, with a knife. 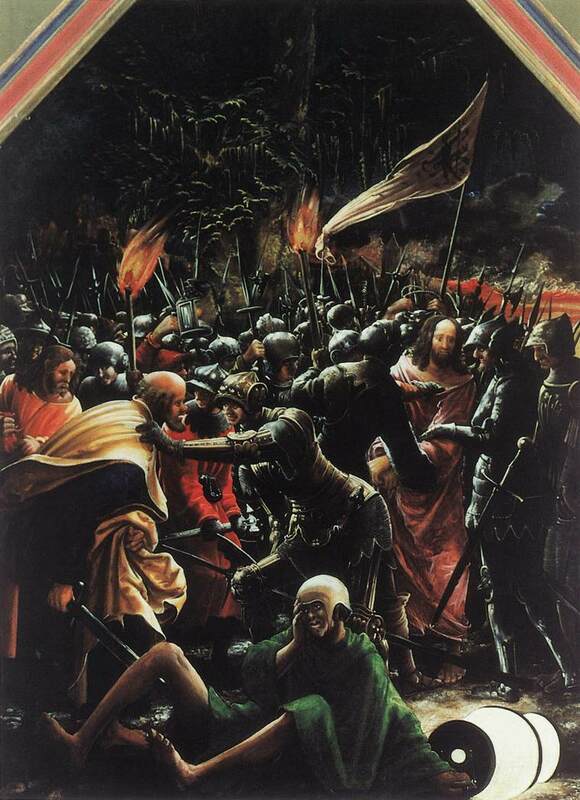 The Capture of Christ; Dieric BOUTS the Elder; oil on canvas; Alte Pinakothek, Munich. The violence of the arrest is represented in close-up. The soldier separates Judas and Jesus who are strangely linked, by their hands on the left, by their gazes on the right. Caravaggio also represents the horrified disciple, probably Mark the evangelist, who runs away. The Taking of Christ; Michelangelo da Merisi CARAVAGGIO; circa 1598; oil on canvas; National Gallery of Ireland, Dublin. 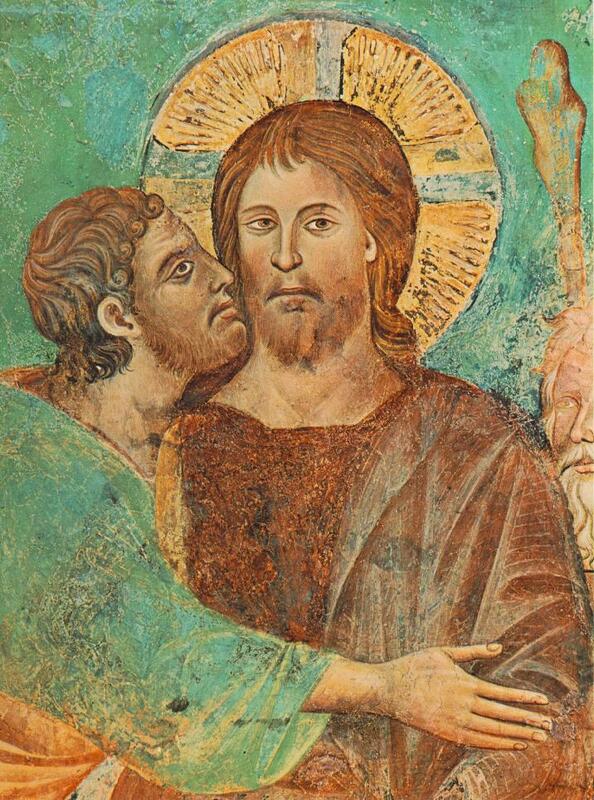 Judas’ kiss is often an embrace; the picture on the left emphasizes treachery since Judas embraces Jesus from behind. The Kiss of Judas; Thomas COUTURE; oil on canvas; private collection. The Arrest of Christ; attributed to CIMABUE; fresco; Basilica St Francis; Assisi, Italy. 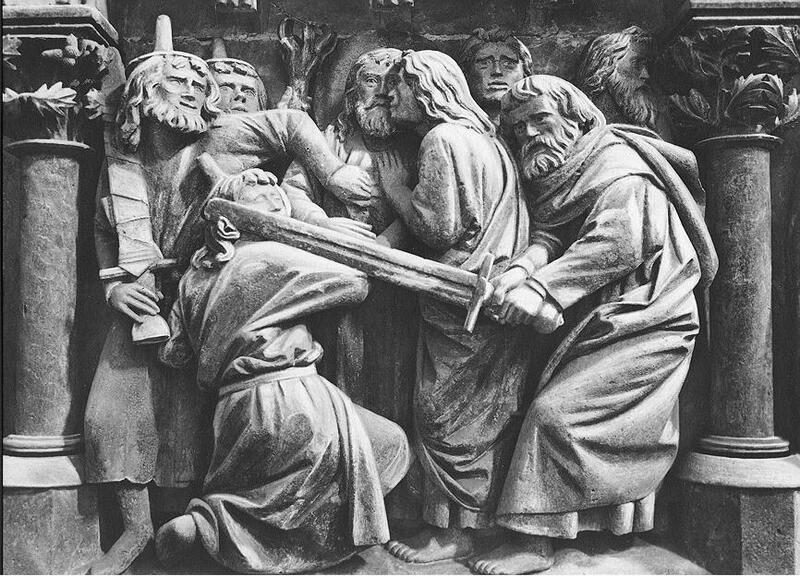 Peter cutting off the ear of the High Priest’s servant becomes the main scene; the kiss of Judas is relegated to the background or lost in the crowd of soldiers. A phrase and a proverb are derived from this scene. The kiss of Judas is that of the false friend, of the traitor par excellence. “Who uses the sword will perish by the sword”. The proverb is completely out of context and defends non-violence. The saying is very general and does not apply to St Peter who is crucified to death.